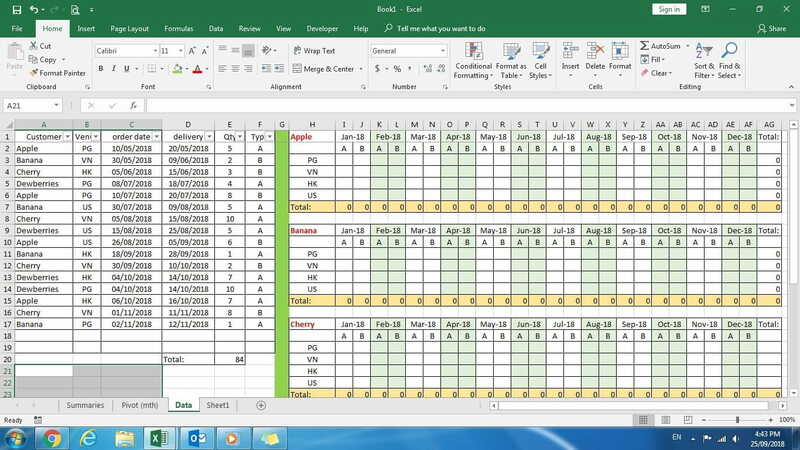 Kindly help to correct the formula for below, I had wrote a formula that to calculate the quantity by month to the order date and also by customer, venue and type but it isn't work. Error pop out said that "You've entered too few arguments for this function"
is it the formula too many or miss out any order? 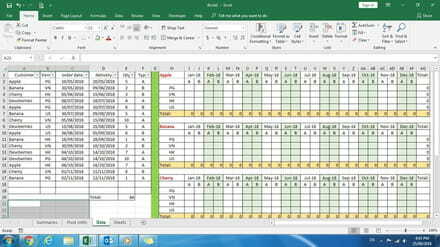 I tried to use a Pivot Table to create a job that is effective, but when add a new entry there is no automatic update the quantity to the summary. Your kind help on this are very much appreciated. Why is there two back to back commas [ ',' ] in the formula? Oops!! no wonder the formula didn't work ^^" thanks a lot! i amend it and try again! Not a problem. That is called TPI (two person integrity)! IT is actually more cost effective to have two programmers at each station, one typing the syntax and the other auditing on the fly! In the long run you save money because production time goes down, and bug troubleshooting happens live and real time!